Today the #BreadBakers are celebrating that harbinger of fall, the pumpkin! If you love Pumpkin Spice Ale you’ll love this twist (sorry!) 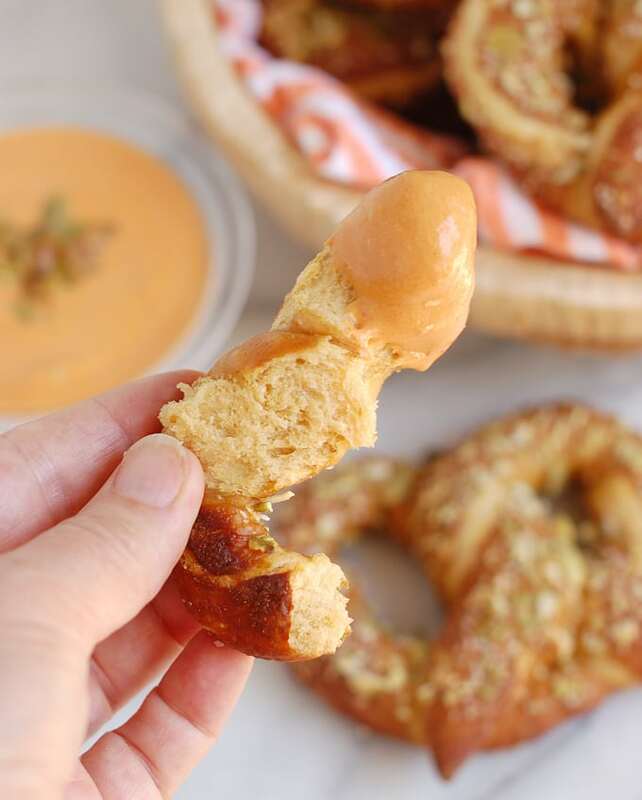 on the soft-pretzel; Pumpkin Spice Ale Soft Pretzels with Pumpkin Chipotle Dip. I’m not sure when exactly Pumpkin Spice Ale became such a big thing, but there’s certainly no denying the popularity of pumpkin spice everything these days. So when I saw the theme for this month’s #BreadBakers event was pumpkin I decided it was time to jump on the Pumpkin Spice bandwagon. Hmmm…Pumpkin Sweet or Pumpkin Savory? 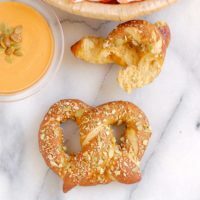 I used a Pumpkin Spice Ale made by a local craft brewer to make savory Pumpkin Spice Ale Soft pretzels (Nope, haven’t been paid by the brewer – just happened to buy the ale) and spicy Pumpkin Chipotle dipping sauce. 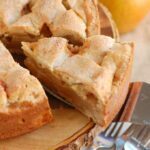 Since pumpkin can go either savory or sweet, I could have gone to the sweet-side by adding more sugar, cinnamon and spice to the dough and making a sweet cream cheese dip. But I wanted to make a snack that reflects the flavor of the Pumpkin Spice Ale, which is not sweet. 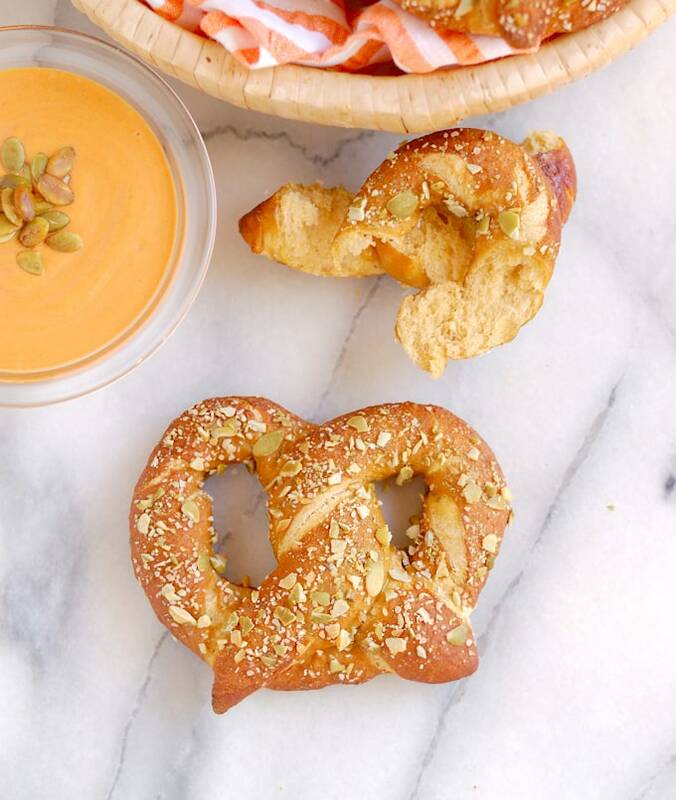 In fact, Pumpkin Spice Ale, or any other beer, would be the perfect drink to go with these pretzels and spicy dip. 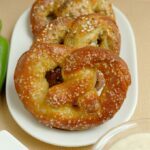 Pumpkin Spice Ale Soft Pretzels are a variation of my Beer Infused Bavarian Soft Pretzels. First of all, I switched out the lager for Pumpkin Spice Ale. Then I replaced the water in the recipe with pumpkin puree. Not only does the puree give the pretzels great flavor, it also imparts a pretty, pale-orange color. Pumpkin Chipotle Dip is so simple to make. Just puree all the ingredients together. 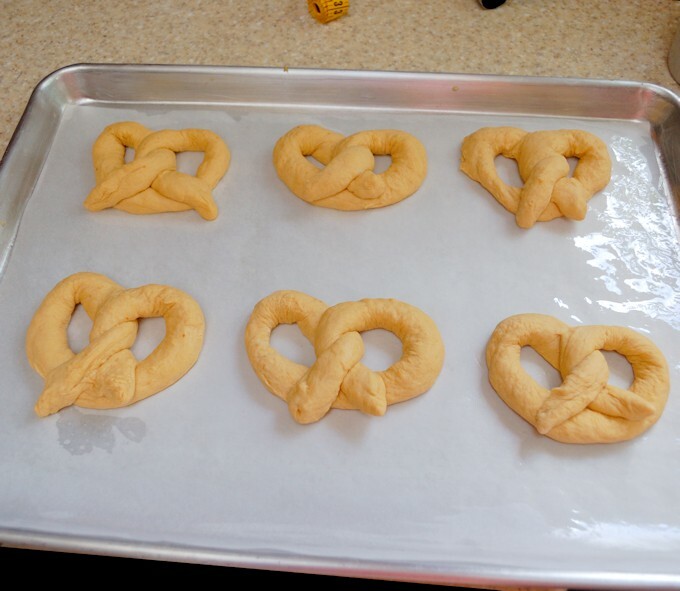 Go here to see more detailed photos of how to shape pretzels. Have you been staying out of the kitchen because it’s too hot in the summer? 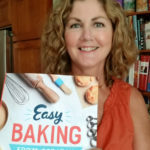 Well, now is a great time to get baking again. 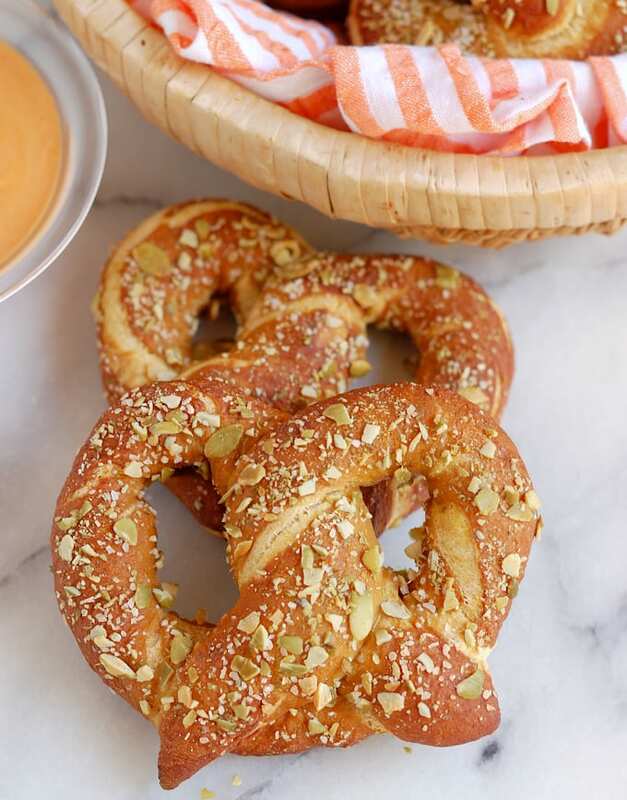 These Pumpkin Spice Ale Soft Pretzels are the perfect snack for your game-day party or tailgating. Special Equipment and ingredients: Mini Food Processor, cooling rack, bench scraper, Chipotle in Adobo, pepitas. Combine the pumpkin puree, ale, salt, sugar and yeast in a mixer with the paddle attached. With the mixer running on low add 2 cups of the flour and mix to form a smooth batter. Switch to the dough hook and add the remaining flour until the dough gathers on the hook and clears the sides of the bowl (if mixing by hand add flour with a wooden spoon until it's too thick then knead remaining flour in by hand). 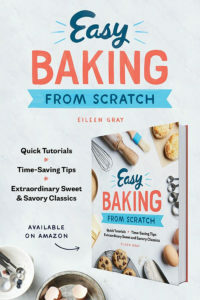 Dump the dough onto a floured surface and knead to form a smooth ball. 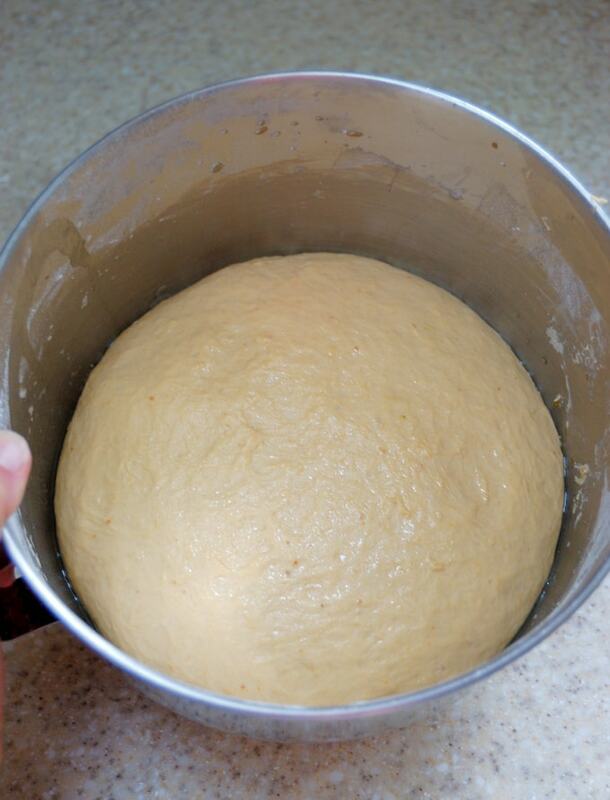 Place the dough in an oiled bowl, turning once to coat the dough, cover with plastic wrap and set aside to double in volume, about 1 - 1 1/2 hours. Place 2 quarts of water and baking soda in a large pot. Preheat the oven to 400°F convection or 425°F regular. Line 2 baking sheets with parchment paper and coat the parchment paper with vegetable oil. 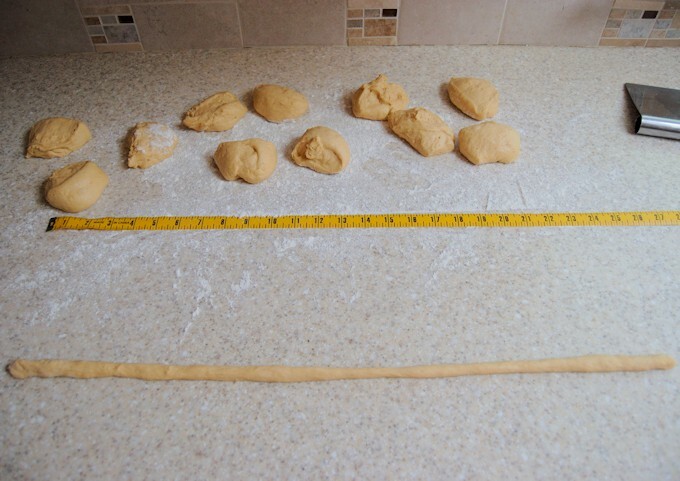 Turn the dough out onto a floured surface and divide into 12 equal pieces. Shape each piece into a rope. Using flat hands, roll the dough back and forth moving your hands in opposite directions from the middle of the rope towards either end. If the dough gets sticky dip your hands in flour and continue. The dough should stick to the surface just a little so that the friction will allow you to pull the dough into a long rope. The longer and thinner the rope the more open the pretzel shape will be. Try to get the rope to about 20"-24"
To form a pretzel lift the dough rope on either end and allow the middle to sit on the surface, forming a "U" shape. Twist the ends of the rope together 2x and fold the twist over and rest on the center of the "U". Lift the pretzel by the two top loops and place on the oiled parchment paper. 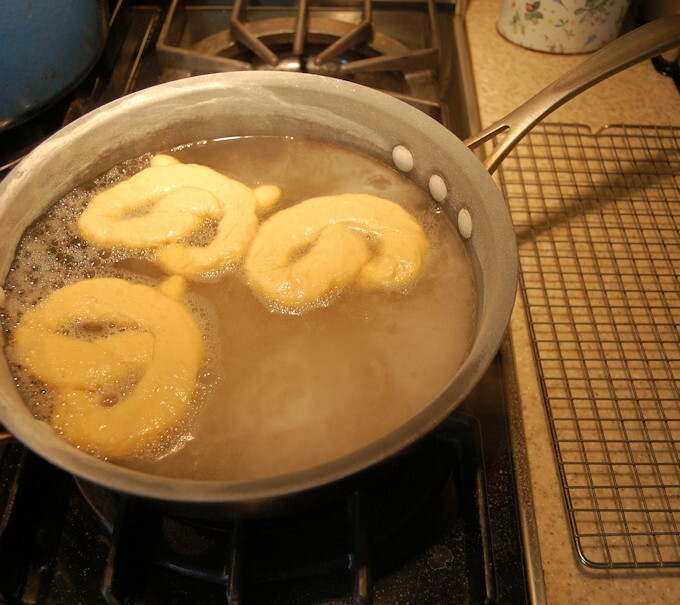 Once the baking soda water is boiling dip the pretzels into the water for about 10 seconds. (I can fit about 3 at a time in my pot, don't overcrowd the pan). Set the boiled pretzels onto a cooling rack and allow them the drain while you boil the remaining pretzels. Transfer the pretzels to the baking sheets (lined with oiled parchment). Brush each pretzel with egg white and sprinkle with pepitas and coarse salt. Turn the sheets halfway through baking so they brown evenly. Enjoy them warm with dip. 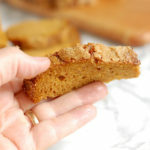 You can use fresh pumpkin puree instead of canned. If the fresh puree is very moist you may need to adjust the amount of flour. oooohhhh, I’m loving these soft chewy pretzels made with ale. Wow, those pretzels look sooooo soft and soooo pretty. 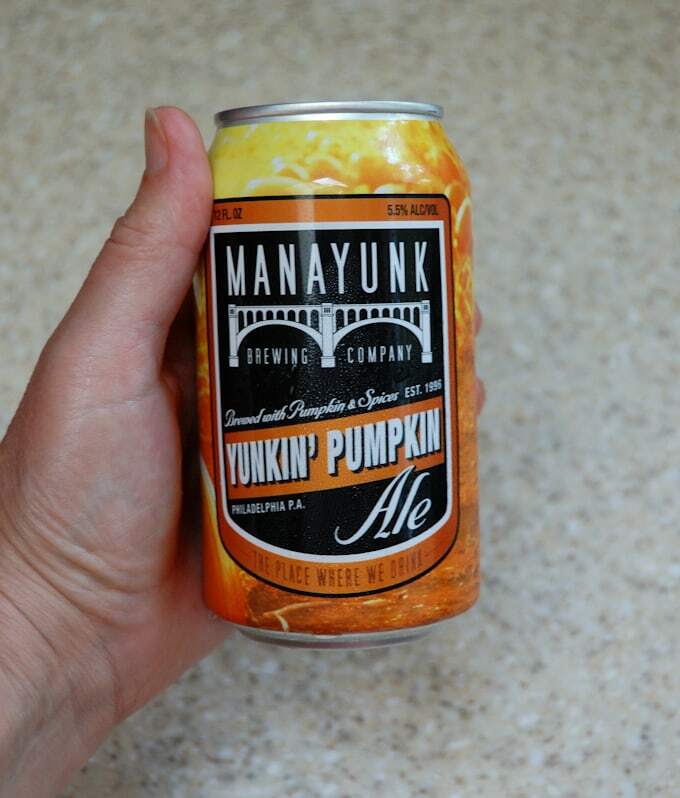 Love the use of pumpkin ale in them. You made such perfect pretzels! I love the addition of the pumpkin puree and the ale– a delightful autumn combination. Thanks, Anne. It is hard to stop at just one. Soft pretzels are my weakness! They are so fun to make but man, once i start eating them I just cannot stop! These look super delicious! Thanks, Amy. It is hard to eat just one (or two)! These are soooo cool! Love them. I had no idea that this ale existed, but your pretzels look simply outstanding. I’m so impressed!!! Pretzels are so beautifully done, they are just waiting to be picked.. prefect. Pretzels with pumpkin and ale? Oh yeah! Heard of ginger ale but not pumpkin ale. 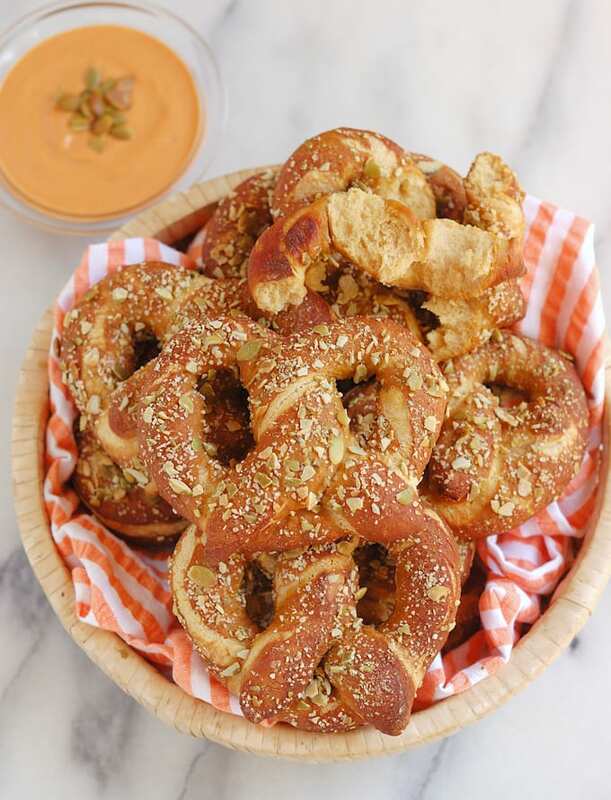 Pretzels look so tempting and making them with pumpkin puree, that’s a different flavour all together. Thanks, Mayuri. The puree not only adds moisture, but a really pretty orange color and a little flavor.